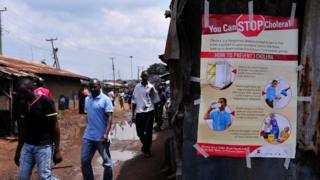 Nearly 50 people have contracted cholera while attending a health conference in Kenya's capital. The infected delegates were among hundreds who had gathered for the four day forum organised by the Ministry of Health at a Nairobi hotel on Tuesday. They have been isolated in a city hospital, but health officials say the number of people infected may rise. It is unclear how they caught the disease, which has led to five deaths in the past month. Cholera is an acute diarrhoeal infection caused by ingestion of food or water contaminated with the bacterium Vibrio cholera. In Yemen, a large cholera outbreak is fast approaching 300,000 cases, according to UN humanitarian chief Stephen O'Brien. He described it as a "man-made catastrophe" caused by both sides of the country's ongoing civil war. In a press release on 24 May, Kenya's Ministry of Health said there had been 146 cases across the country since the outbreak began. Some of those infected had attended a wedding at an upmarket estate in Nairobi. As a result, authorities put in place emergency measures to try and curb its spread. An outbreak two years ago killed 65 people across Kenya. Haiti after Hurricane Matthew: Can a cholera epidemic be avoided?